In this article, I will explain you about asp.net calendar control and how to use it in a simple way. ASP.NET provides a Calendar control that is used to display a calendar on the Web page. Birthdays, anniversaries, appointments, holidays, bill payments, and project deadlines. All these have one thing in common. Guess? It's a date. It is difficult to remember dates so for that calendar comes to your rescue. ASP.NET provides a Calendar control that is used to display a calendar on the Web page. This control displays a one-month calendar that allows the user to select dates and move to the next and previous months. By default, this control displays the name of the current month, day headings for the days of the weeks, days of the month and arrow characters for navigation to the previous or next month. The Calendar is complex, powerful Web server control that you can use to add calendar feature to your web page. We can use calendar control display any date between 0 A.D. and 9999A.D. The Calender control can be used to select a single date or multiple dates. The SelectionMode property is used for this. Day Allow selection of a single date. DayWeek Allows the selection of a single date or a complete week. Allow selection of single date, complete week or complete month. None Doesn't allow you to select any date. You can also set the properties for the calendar either by selecting the Auto Format property by right clicking on the Calendar control or by manually setting them one by one. There are many properties of Calendar control to customize the functionality and appearance. These can be read at msdn. 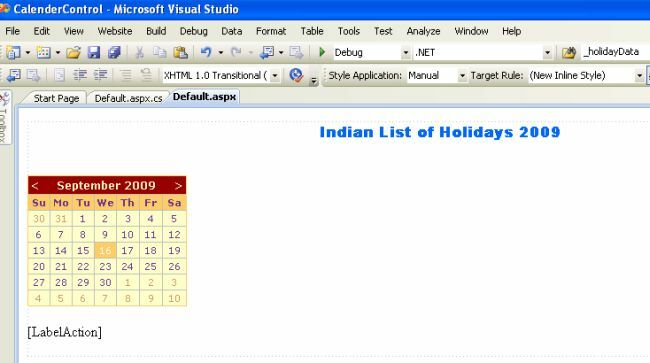 Let us start with a basic example that will help you in making a small application showing list of Indian holidays. <asp:Label ID="Label1" runat="server" Font-Bold="True" Font-Names="Arial Black" Font-Size="Medium"
<asp:Calendar ID="Calendar1" runat="server" BackColor="#FFFFCC" BorderColor="#FFCC66"
In the above code we have used DayRender, SelectionChanged and VisibleMonthChanged events. A method called Getholiday() is added to populate a collection of holidays. In the Calendar1_DayRender event handler we are displaying the holiday in a label, which is created, and is added to the Cell objects Controls collection. I hope that this article would have helped you in understanding the calendar control. Certainly there are a lot of variants how calendar control can be designed, but my aim was to provide just a basic tutorial on writing and using Calendar controls. Please share it if you know more about this article. Your feedback and constructive contributions are welcome.